Kick off your visit on the 14th (Wed): take in the exciting artwork at Museu Calouste Gulbenkian and then take a stroll through Alfama. 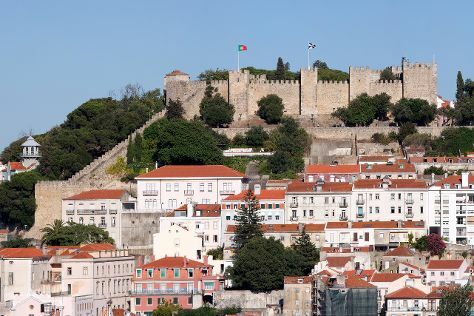 For ratings, maps, where to stay, and other tourist information, read our Lisbon trip planner. If you are flying in from Australia, the closest major airport is Humberto Delgado Airport (Lisbon Portela Airport). In August, plan for daily highs up to 35°C, and evening lows to 20°C. Wrap up your sightseeing on the 14th (Wed) to allow time to drive to Sintra. To see maps, reviews, other places to visit, and more tourist information, refer to the Sintra trip planner . Sintra is very close to Lisbon. In August in Sintra, expect temperatures between 34°C during the day and 20°C at night. Finish your sightseeing early on the 15th (Thu) to allow enough time to travel to Cadaval. Cadaval is a municipality in Lisbon District in Portugal. Start off your visit on the 15th (Thu): make a trip to Marinhas de Sal, then have some family-friendly fun at KIRO Kartodromo do Oeste, then learn about winemaking at Quinta do Sanguinhal, and finally learn about winemaking at Quinta do Gradil. To find photos, where to stay, other places to visit, and other tourist information, use the Cadaval online tour builder . Drive from Sintra to Cadaval in an hour. In August, plan for daily highs up to 34°C, and evening lows to 20°C. Finish your sightseeing early on the 16th (Fri) so you can travel to Obidos. Start off your visit on the 16th (Fri): enjoy the sand and surf at Praia da Nazare, contemplate in the serene atmosphere at Monastery of Alcobaca, and then make a trip to Obidos Village. Use Inspirock's suggestions to plan your Obidos trip and find the best activities and attractions for your vacation. Obidos is just a stone's throw from Cadaval. While traveling from Cadaval, expect slightly colder days and about the same nights in Obidos, ranging from highs of 30°C to lows of 18°C. On the 17th (Sat), wrap the sightseeing up by early afternoon so you can drive to Porto. Vieguini - Bike & Scooter Rental Porto - best way to discover the city has been added to your itinerary. Porto Cathedral (Se Catedral) and Palacio da Bolsa are good opportunities to explore the local culture. Dedicate the 19th (Mon) to wine at some of the top wineries in the area. There's much more to do: snap pictures at Ponte de Dom Luis I, explore the activities along Rio Douro, appreciate the history behind Monumento aos Herois da Guerra Peninsular, and take in the architecture and atmosphere at Igreja da Ordem Terceira de São Francisco. To see reviews, more things to do, traveler tips, and other tourist information, you can read our Porto online itinerary builder . You can drive from Obidos to Porto in 2.5 hours. Alternatively, you can do a combination of bus and flight; or take a train. In August, plan for daily highs up to 28°C, and evening lows to 17°C. On the 20th (Tue), wrap the sightseeing up by early afternoon so you can travel to Lisbon. Visiting Nature & Wildlife Tours and Speed Boats Tours will get you outdoors. Get a sense of the local culture at Jeronimos Monastery and Castelo de S. Jorge. When in Lisbon, make a side trip to see Arrabida Natural Park in Setubal, approximately 44 minutes away. Explore Lisbon further: steep yourself in history at Belém Tower, learn about all things military at Museum of National Republican Guard, admire the masterpieces at National Tile Museum, and meet the residents at Lisbon Oceanarium. For ratings, more things to do, where to stay, and other tourist information, use the Lisbon holiday maker website . Traveling by flight from Porto to Lisbon takes 2.5 hours. Alternatively, you can take a train; or drive. Traveling from Porto in August, expect nights in Lisbon to be about the same, around 20°C, while days are somewhat warmer, around 35°C. Finish up your sightseeing early on the 25th (Sun) so you can travel back home.